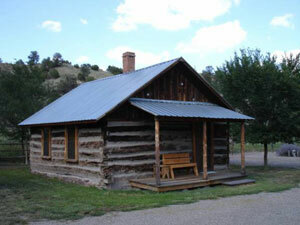 The Pye Cabin was home to a succession of miners through out the silver boom period, then was home to ranch hands and their families up into the 1940s. It was used as a hunting cabin for a few years, and then stood empty and unused for almost fifty years. It has been completely refurbished into a modern two bedroom vacation cabin. Mr. Pye was an Englishman who had been in the U.S. Army. He mustered out of the Army in Arizona Territory in the 1870s. He drifted into New Mexico Territory, and was a Mule Skinner, a Scout, an Indian fighter, and sometimes Prospector. In the late 1870s Mr. Pye had a contract with the U.S. Army to haul freight to the Warm Springs Indian Reservation by pack mules. Some time in 1878, Mr. Pye found himself hunkered down in a canyon on the east slope of the Black Range, to get away from a band of Indians. While in the canyon he found some float (rock that had washed down from above in a flood) that he thought might contain silver. He carried the samples with him and eventually had it assayed. The assay showed that the sample was “high in chloride of silver”. He then had to make a decision. He could abandon his contract and prospect to see if he could find the location of the sample, or he could work out the remainder of his contract. Perhaps his decision to finish his contract speaks to his character, or perhaps he knew that his contract paid for sure, while prospecting was iffy at best. In 1879 with his contract completed, Mr. Pye appeared in Georgetown, a mining town on the west side of the Black Range, to try to find companions to help him prospect for the location of his silver. The miners were reluctant to join his venture because the canyon where he found his samples was in Apache Chief Victorio’s favorite hunting grounds. Pye was finally able to entice two young men recently arrived from Kansas to join him by telling them he knew of “a secret canyon with a ledge of silver.” The trio arrived in the vicinity of present day Chloride and built a rough log cabin prior to starting their prospecting. With the cabin finished, they turned their attention to the task they were here for. They located a seam in the cliff a few hundred yards west of where they built the cabin that appeared to have the same features as Pye’s original samples. They began a drift into the cliff but before they could get very far the Indians found them. There was a fight, and Pye was killed, supposedly “because his gun jammed.” His two companions were able to escape and eventually made their way to Hillsboro. When they told their 'embellished’ story about the secret canyon and the ledge of silver, they started a rush into the area. A tent city immediately appeared in the canyon next to the first log cabin, and the mountains became full of prospectors. Chloride, the name selected for the town, grew rapidly, and an affidavit filed in 1881 asking for official Townsite status states that “there are currently seven well established businesses and over twenty substantial houses."